Understand your investment goals and risk appetite. We understand every customer has unique investment needs. Now we aim to help you understand your own needs and make the most appropriate choices. By completing the Investment Risk Profiling Questionnaire, you will have a better understanding of your financial capability, investment objectives and risk appetite. The result will classify you in one of the six Investor Profiles, ranging from "IR 1 "- to "IR6", where rating “IR1” is the lowest and rating “IR6” is the highest. By completing the Investment Client Profiling Questionnaire, you will have a better understanding of your knowledge and experience in a particular product category. Investment products are assigned a Product Rating from 1 (lowest) to 6 (highest) based on Citibank’s internal risk rating methodology which reflects a range of qualitative and quantitative factors. 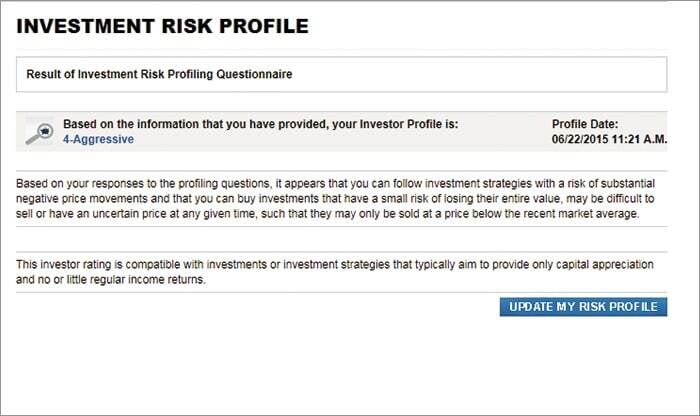 It is important to update your risk profile and client profile regularly before making investment decisions. You can do it online in just a few clicks. Once completed, we will be able to offer you the most suitable investment solutions with reference to your attitude towards risk. 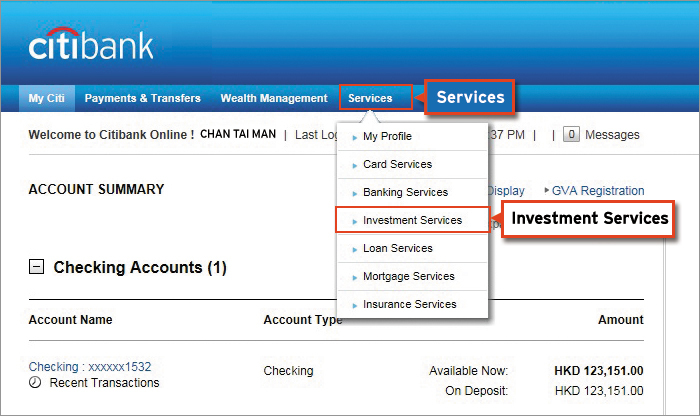 Logon to Citibank® Online > Choose "Services" & "Investment Services"
Select "My Investment Risk Profile" or "My Investment Client Profile (Knowledge and Experience)"
You may update your risk profile no more than twice on the same day for the same relationship via Citibank® Online. 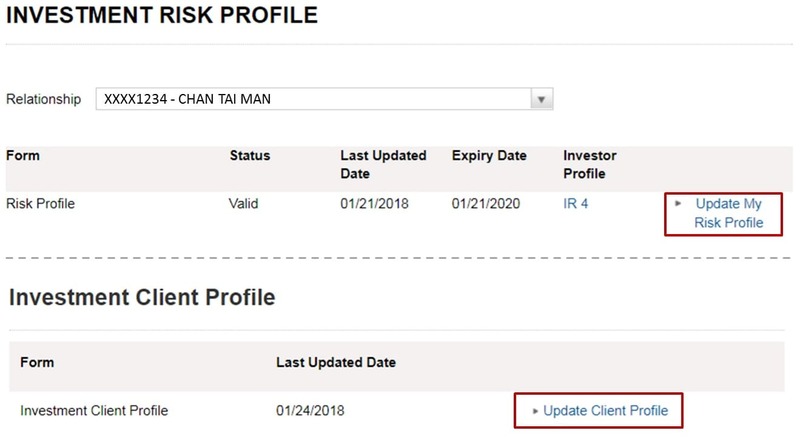 Thereafter, should you wish to update your risk profile again within 30 days, please contact your Relationship Manager or call hotline at (852) 2962 3677 during service hours (Monday to Friday: 9:30a.m. – 7:00p.m.). A physical or electronic profiling advice will be delivered to you for record. 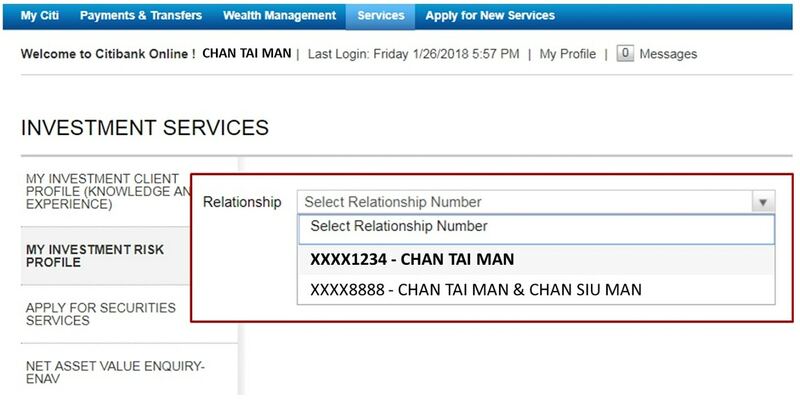 Investment products are not bank deposits or obligations of, or guaranteed by, Citibank (Hong Kong) Limited, Citibank N.A., Citigroup Inc., or any of its affiliates or subsidiaries, or by any local government or insurance agency, unless specifically stated. Investments involve risks, including the possible loss of principal amount invested. Past performance is not indicative of future results, prices can go up or down. Investors investing in products denominated in non-local currency should be aware of the risks of exchange rate fluctuations that may cause a loss of principal when the foreign currency is converted back to the Investors’ home currency. Investments are not available to U.S. persons. All applications for Investment Products are subject to specific Terms and Conditions of the individual products.